This book aims to poke as many holes as possible in the nature/culture divide. 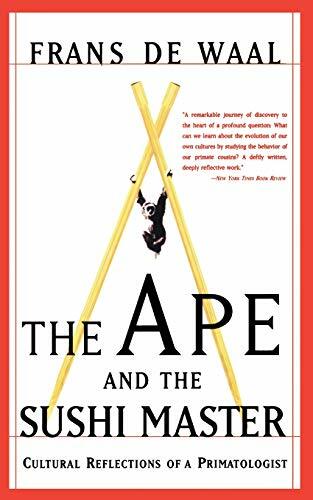 Arguing that apes have created their own distinctive culture, Frans the Waal challenges our most basic assumptions about who we are and how we differ from other animals. With a delightful mix of anecdote, clinical study and fieldwork, he corrects our ignorant belief that humans are the only creatures to have made the leap from natural to the cultural domain. Now, as an employee of the Jane Goodall Institute, I already know that. But I can never read enough about this totally fascinating subject. It was more or less what I expected it to be, although I am ever disappointed when scholars are elaborating on the personal and professional conflicts within the university world. I find that a trifle boring. Nevertheless, Frans de Waal clearly shows that animals have culture, and not just the tool-making primates. And that there is a great urge in certain fields of the academic world to define culture as something which humans have and animals have not, this stemming from the notion that culture is something opposed from nature and that humans are not part of nature either. It came back to me. I will find a new place for it. Tijdens het concert van Sirocco. Dit is een fantastisch leerzaam boek, dat nu terugkeert naar de plaats waar een deel van de ideeën zijn ontstaan: het chimpansee-verblijf in Burgers. Dat wil zeggen... ergens erbuiten dus.